San Diego, CA (June 19, 2017) – This August, General Joe Colton, the original G.I. JOE, will take the fight directly to the TRANSFORMERS home world of Cybertron in the Hasbro Comic Book Event of 2017 – First Strike! Tags: Action Man, Ander Zarate, Aubrey Sitterson, August happenings!, Bi-Weekly fun!, Chris Panda, Christos Gage, Council of Worlds, Cybertron, David A. Rodriguez, David Hedgecock, G.I. Joe, Guido Guidi, Hasbro, IDW, Ilias Kyriazis, Indie News, Joe Colton, John Barber, M.A.S.K. 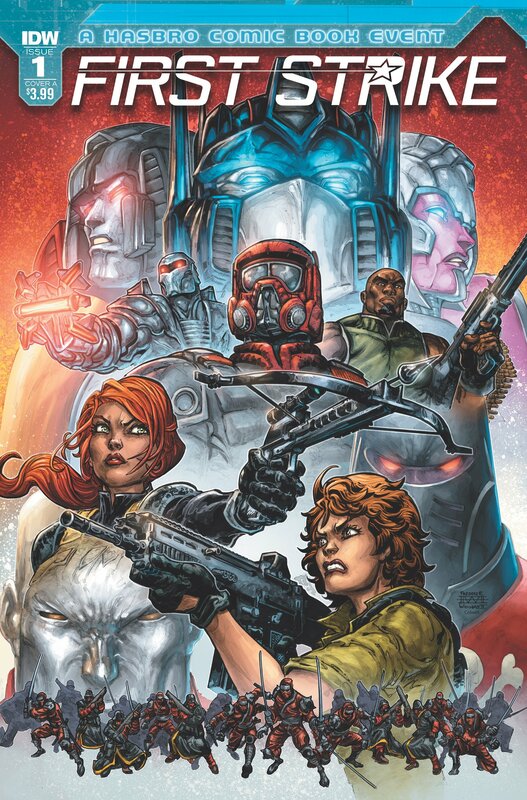 : Mobile Armored Strike Kommand, Mairghread Scott, Max Dunbar, Micronatus, Optimus Prime's got mad leadership skills!, Plenty of exploration in upcoming One-shots!, ROM, Small Press Happenings, Some just can't be happy with certain things!, The Plot To Destroy ALL Transformers Has Begun!, Uniting after REVOLUTION!